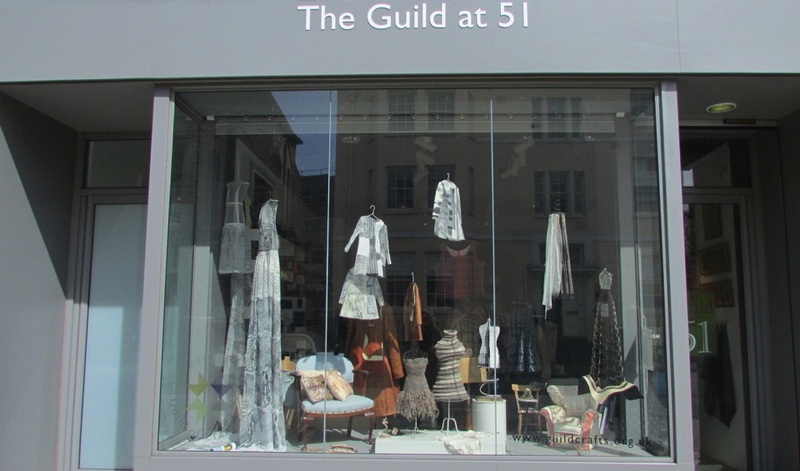 In the window of The Guild at 51 Studio Seven present SPRINGBOARD II, a collection of new work developed from a 3D sketchbook of ideas inspired by the old Chair Factory at Chalford, near Stroud, which has become the Victoria Works Studios. The work draws on the colours, textures and patterns in the building’s structure, the rusty springs, pattern blocks and leather left behind when the factory closed and explores the anthropomorphic qualities of chairs. Studio Seven are Liz Lippiatt, Jenny Bicat, Anne Rogers, Sarah Pearson Cooke, Corinne Hockley, Sarah Cant and Kathryn Clarke, all of whom are also members of the Guild. The group has a reputation for cutting edge collaboration, bringing textiles to audiences in new and surprising contexts. SPRINGBOARD II is presented as part of the SIT Select Festival. This entry was posted in categories; Exhibition, Stroud International Textiles, Textiles.